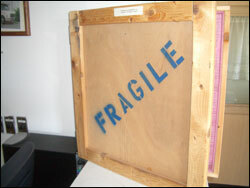 Almost Home Moving Storage Excels in the moving of your fine artwork, we understand that every move is different and we adapt our knowledge of packing and crating to suit the move at hand, whether that move is a single painting, or a whole museum rest assured Almost Home will be prepared to do the job. Almost Home Moving and Storage has a staff that is friendly, courteous, and knowledgeable. Our crate and packing staff are among the best in the business, constantly evolving as the industry changes, we stay up to date in all packing and crating methods, along with the latest in material and supplies. From the moment the piece is first inspected until the time its is unwrapped and put into place Almost Home Moving and Storage will leave you with a stress free, and trusting move. We also have a climate controlled storage facility complete with viewing rooms and a secure vault built into our warehouse. Are you looking to ship internationally? No problem, we will handle the logistics from start to finish. Almost Home is also a fully licensed and insured Moving and Storage company.